To Pé it was essential first to develop a dance for silence before she would engage into a relation with music. Once the dance vocabulary became strong and independent enough, it seemed to her that the relation to music should be non-decorative nor atmospheric and, thus, mature enough. 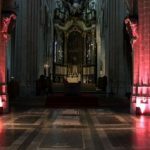 With the organ she discovered a great musical tradition and repertoire and above all she encountered a very physical, bodily instrument with dazzling complexity, responding to her search for playful complexity in dance. 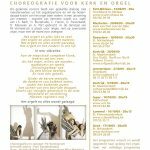 After researching this instrument and the music in solo format in an improvised way, she conceived in 2009, in collaboration with master-organist Jan Vermeire, a work for 3 very different dancers. 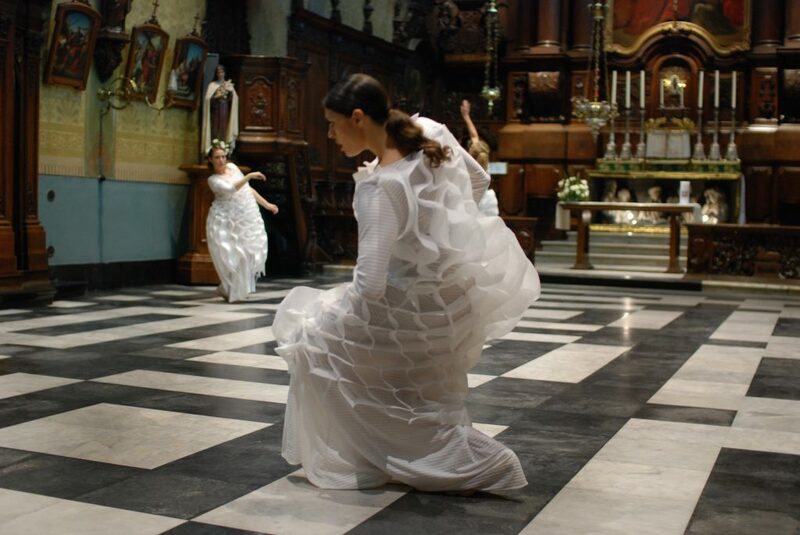 In ‘It organs / the body’ the dance originates and arises from the physical impact of the organ. The different sound records of the organ find an echo in the rich palette of each dancer. As dazzlingly complex the organ can be, equally the dancers search to be. 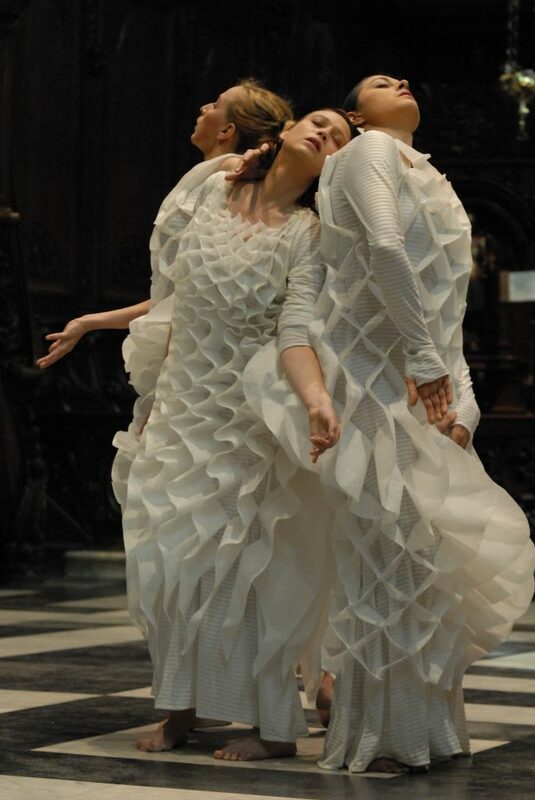 The dancers abandon themselves to this majestic instrument and become as the organ: complex, layered, full of counterpoints, playful, transcendent. Again the dance is a state of being and becomes a long non-stop journey. Cherishing the differences of each dancer, they move as one complex body, in synchronic as well as ‘organic’ choreographies. 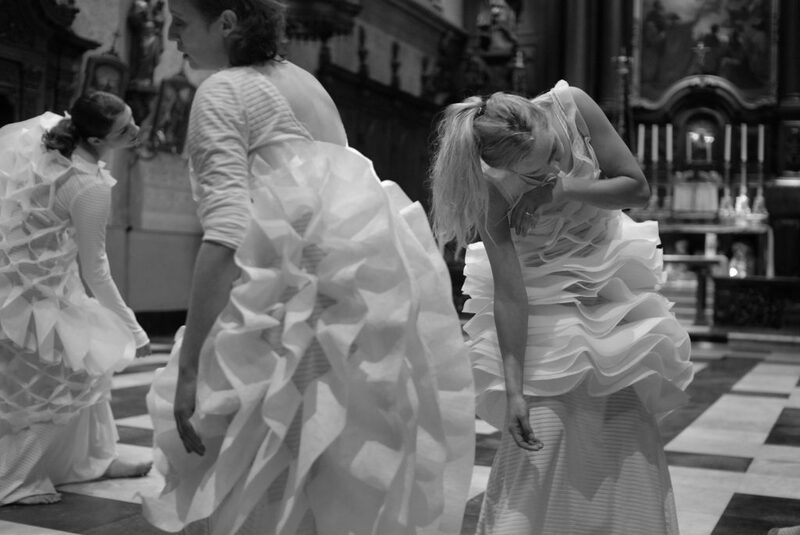 Moving from Bach to Messiaen, ‘It organs / the body’ alternates intensity and liberating energy caught in the futuristic costumes of designer Anita Evenepoel, reflecting the wind that makes dancers and instrument move. 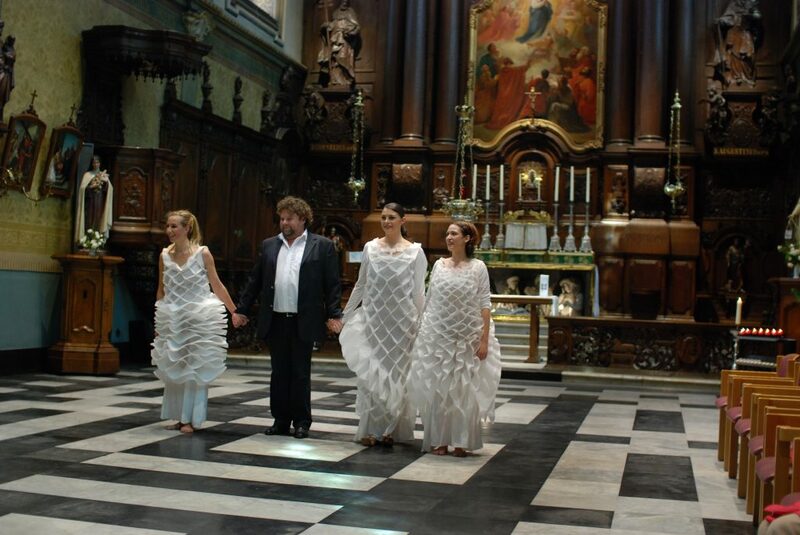 The dance also has a function : to make the layered organ music transparant in a physical and visible way, and to stress the contemporary power of the organ. 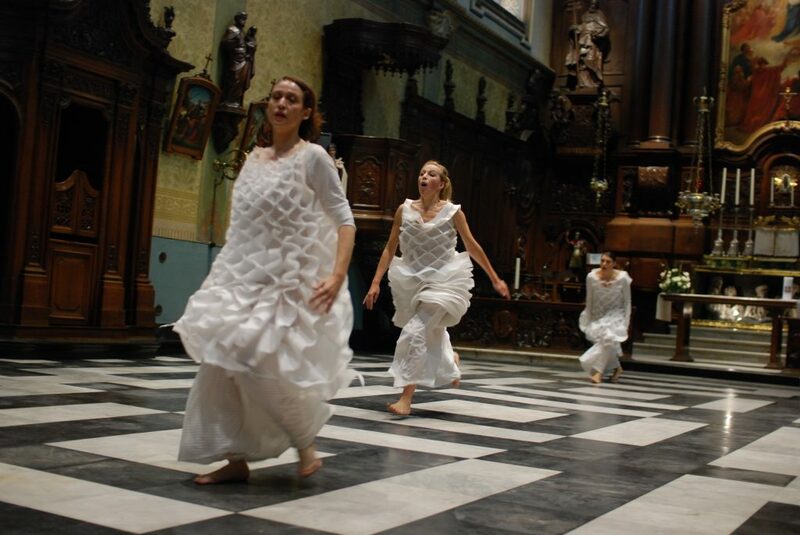 ‘It organs / the body’ reflects also on the possible visible/tangible place of religion in contemporary art and dance, and seeks to protect or, maybe better, to ‘love’ the treasures in our own culture in a non-conformist way. 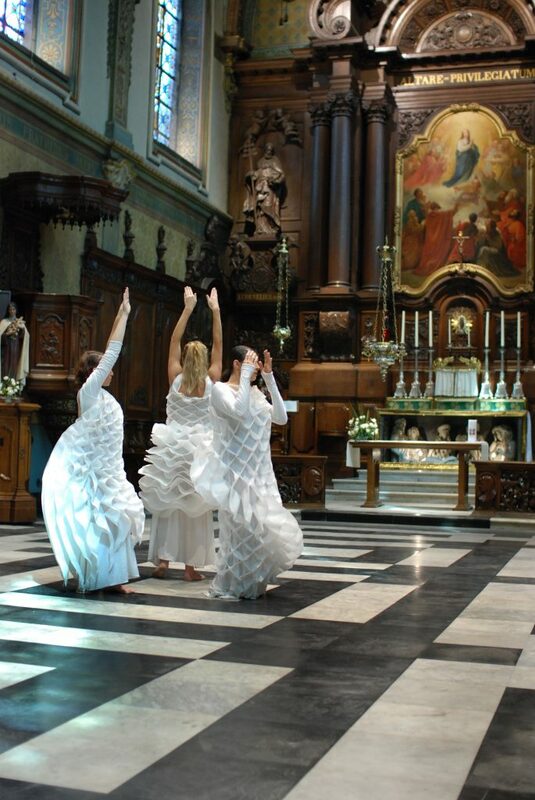 This piece places the dancers between movable and immovable, between material and spiritual heritage. Between tradition and future-oriented creation. 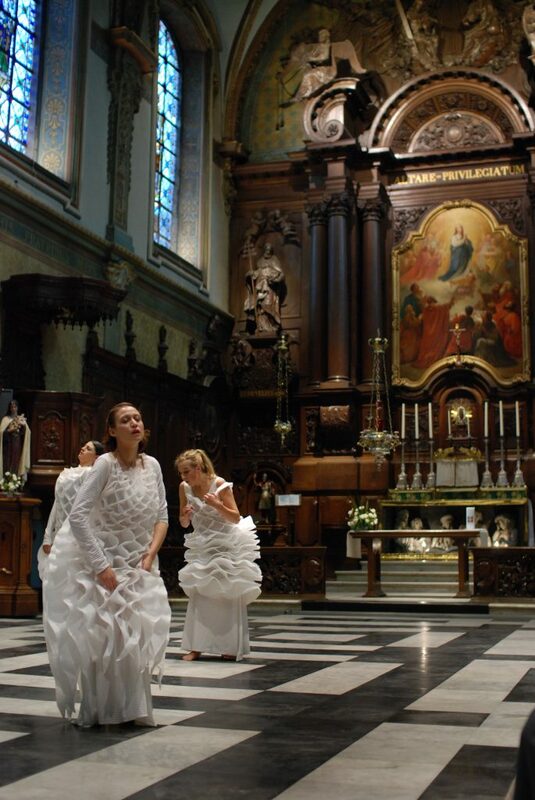 With this work Pé proposes a contemporary dance in which there is room for religion/the sacred, not in a traumatised nor in sugar-sweet manner, but with courage to surrender again and again. Fullness opposed to minimalism and organic unpredictability opposed to repetition. ‘When in Japan, I was looking for a performing art linked to the sacred. Naturally, I often visited temples and researched the religions and philosophies of East and West. But it was only back home I could elaborate this work, in search of the force and strength of one’s own religious background despite the negative connotations it has in contemporary art and society. 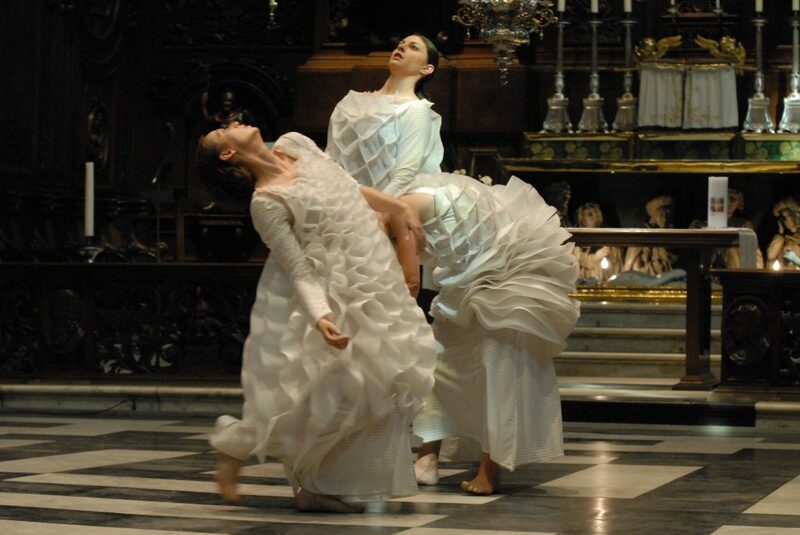 Although the dance itself possesses no narrative element, the fact to present three female dancers, barefoot, in a church, surrendering to the sound of an organ, has a profound signification’ (Pé Vermeersch).